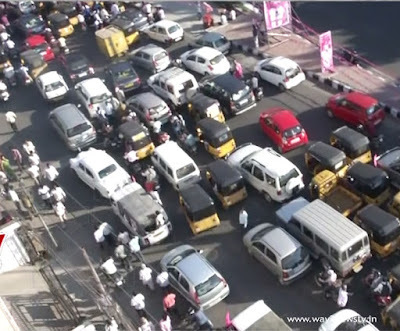 The number of vehicles in Hyderabad is increasing day by day. by calculate all the two wheelers, four wheelers ... one of the every five members has a vehicle.However, there are allegations that the officers are don't mind about that. already said to everyone should work hard for urban development, even though The authorities do not mind.In particular, the government ordered two years earlier to bring about changes in the public transport system and make international arrangements. RTC buses, autos, MNTS suburban trains, and most of the rental cars are also used for public transport. The RDS runs 3850 buses for public transportation, which is 25 lakhs and cabs more than 25,000. Workers in IT companies have access to cars without night and night. All of these suggested that it be brought under control by modern technology. The Department of Transport, RTC, GHMC and the Police have coordinated the creation of a better transport system. At the same time, the RTC and Transport Officer Mamandar Reddy, along with Transport Minister P.Mahender Reddy, In Mumbai, the 'que' system has been praised for being amazing. The officials of the respective departments seem to have been handcuffed when the government ordered the safety of the security. In the public sector, RTC buses, private cabs and autos have been ordered to create a separate regulatory cost set up by GPS. This is where the caterpillar dug is made up of the same. The government has ordered various arrangements to be made in order to make it universal. The GTS devices have been installed in Metro Express. However, the details of the RTC buses should be provided through GPS technology. But because of the arrangements made by the aristocrats, it did not produce good results. More than a thousand RTC bus parties have been set up in connection with the fate of the woman. The Transport Department officials are looking to see if the RDC is damaged with private transport vehicles. Private vehicles operators are treated as commuters.